Your financial projections are completed and show that you need a 100,000 investment, but how much of the business do you need to give away to get that. 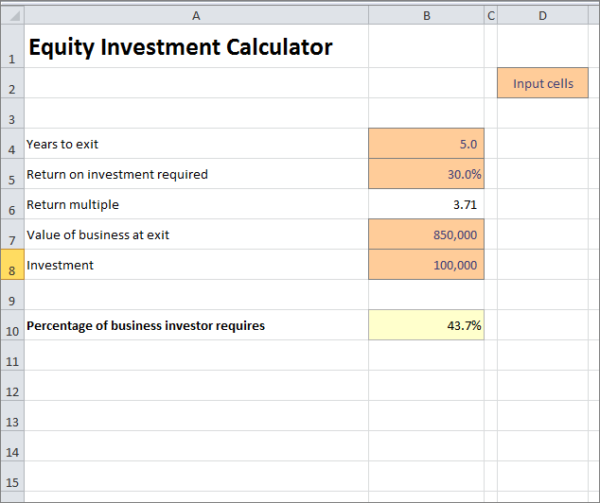 This equity investment calculator can be used to help estimate the percentage of equity an investor might require for their investment in the startup business. How do you estimate the percentage equity to be given to an investor for the first round of funding for a startup? The investor will be seeking a level of return commensurate with the risks involved. The higher the risk, the higher the return required, and the greater the percentage ownership the investor will require. Suppose for example your financial projections show you require an investment of 100,000 and you estimate the value of the business in 5 years to be 850,000. The investor requires a 30% annual return on their investment. The first step is to calculate the value of the business today based on the investors required return as follows. Since the investor is to invest 100,000 in the business the percentage required to achieve the 30% return is calculated as follow. In this equity investment calculator example the investor would require 43.7% of the business for their investment of 100,000 in order to make a 30% annual return in each of the 5 years. The equity investment calculator can be used to carry out the calculations described above by entering details relating to the number of years to exit, the investors required return, the value of the business on exit, and finally the amount of investment required. The equity investment calculator, which is available for download below, calculates the percentage of the business needed by the investor to achieve their required return. Enter the number of years after which the investor will realize their return. Enter the annual return the investor requires. For example, if the investor requires a 30% compound return each year enter 30%. For information purposes the equity investment calculator works out the return multiple required by the investor based on the number of years to exit and the percentage return required. The return multiple is the amount the investor receives on exit divided by the amount invested. In the example above the return multiple is 3.71 calculated as follows. Enter the estimated value of the business at the point at which the investor exits. There are various methods used to estimate the value for a business, some of these are discussed in our business valuation method tutorial, and our discounted cash flow valuation calculator is available to help with the calculation. Enter the investment amount. Your financial projections should give an indication of the amount of equity investment required. Obviously the investment amount may come from a number of investors and a separate calculation will be needed for each. The equity investment calculator works out the percentage of the business the investor requires to achieve their return. It should be noted that the percentage calculated is only an indication and simply provides a starting point for discussions. Ultimately the percentage of equity given for an investment will be subject to negotiation and professional advice should always be sort before coming to any agreement with an investor. The equity investment calculator is available for download in Excel format by following the link below. Users use this investment equity calculator at their own risk. We make no warranty or representation as to its accuracy and we are covered by the terms of our legal disclaimer, which you are deemed to have read. This is an example of investor equity percentage calculator that you might use when preparing financial projections in Excel. It is purely illustrative of equity investment planning software. This is not intended to reflect general standards or targets for any particular company or sector. If you do spot a mistake in the equity investment template, please let us know and we will try to fix it.